Progress in atmospheric chemistry research is often linked to the availability of new techniques for measuring trace gas concentrations in the atmosphere. 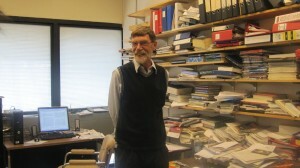 The Harris Research Group is active in the development and field application of spectroscopic methods for trace gas detection and their use in investigating phenomena of current interest in Atmospheric Chemistry, including regional oxidant formation, biomass burning, biogenic sources and heterogeneous transformations. Since the movement of air knows no boundaries, our work often includes international collaborations with government, industry, other universities and agencies.